any tree or shrub of the genus Juniperus, aromatic evergreens of the family Cupressaceae (cypress family), widely distributed over the north temperate zone. Many are valuable as a source of lumber and oil. The small fleshy cones are berrylike in appearance. 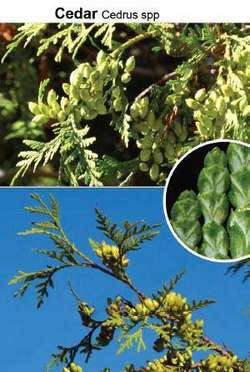 [Lat.,=tree of life], aromatic evergreen tree of the genus Thuja of the family Cupressaceae (cypress family), with scalelike leaves borne on flattened branchlets of a fanlike appearance and with very small cones. ..... Click the link for more information. , class Pinopsida, order Coniferales, family Pinaceae. Looks like juniper. (dry mealy blue-green berries almost all stone, little flesh. Juniper berries have 3-7 stones, whereas cedar has one large stone). Grows 10-20 feet high and wide. Bark is shaggy and soft. Chew cedar leaves to clean teeth. Cedar berries help diabetics cut down on insulin. (helps pancreas) Berries also used to expel worms, fight colds, coughs, rheumatism, yeast, fungus, anti-tumor activity. Leaf branches used for fungus, worms, lung problems like asthma and bronchitis, prostate urinary issues, herpes. Antiseptic expectorant. Indians used it in sweat lodges for arthritis and rheumatism. Do not take internally if pregnant. Contains podophyllotoxin, used for cancer. May be toxic in high amounts. Do not take cedar oil internally. (Cedrus), a genus of coniferous evergreen trees of the family Pinaceae. The trunk is 25–50 m high, with a dark gray, dehiscent, and scaly bark. The crown is spreading and pyramidal or umbrelled (on old trees). The evergreen leaves are acicular, trihedral or tetrahedral, stiff, and spiny; they range in color from dark green and blue-green to silver-gray. The leaves are in fascicles of 30–40 on short shoots (pulvini) or spirally arranged and single on long shoots. The cedar blossoms in the fall. The anther spikelets are individual and surrounded by groups of leaves; the pollen has sacs. The cones are individual, erect, barrel-shaped or ovid, and elongated (length, 5–10 cm; width, 4–6 cm); they mature and fall in the second or third year. The seed-bearing scales are imbricate, appressed, and shaped like broad kidneys. The seeds are resinous, 12–18 mm long, triangular, and winged; they are not edible. The cedar has a surface root system. Cedars grow on mountains at altitudes of 1,300–3,600 m, forming cedar forests with fir, spruce, pine, oak, and four other species of trees. The Atlas cedar (Cedrus atlantica) is found in the Atlas Mountains of northwest Africa. The cedar of Lebanon (C. libani) grows in Lebanon and Syria and on the Cilician Taurus in Asia Minor. The Cyprian cedar (C. brevifolia) is found on Cyprus; the deodar (C. deodard) in the Western Himalayas. The wood is yellowish or reddish, fragrant, and resistant to fungus and insect damage. Cedar trees are cultivated in parks. The blue and silver varieties are particularly valuable. In the USSR cedars, most frequently the Atlas and deodar, are cultivated as ornamentals in the Crimea, Caucasus, and southern Middle Asia. The Atlas is 40 m high and has a pyramidal crown of bluish green, grayish silver, or, less commonly, green needles. The needles measure less than 2.5 cm long. The deodar is 50 m high, with a pyramidal crown and light gray-green slender needles. The needles are 2.5–5.0 cm long. Several species of pine (for example, the nut pines) and the incense cedars of the coniferous genus Libocedrus of the family Cupressaceae are incorrectly called cedars. Six species of incense cedar are found in New Zealand, New Caledonia, and southern Chile; two species, L. chilensis and L. decurens, are cultivated in the Crimea and Transcaucasia. Several other species of trees are sometimes called cedar. An American juniper, Juniperus virginiana, is also known as the eastern-red cedar. The American arborvitae (Thuja occidentalis) is sometimes called the white cedar. Walter, H. Die Vegetation der Erde in öko-physiologischen Betrachtung, vol. 2. Jena, 1968. The common name for a large number of evergreen trees in the order Pinales having fragrant, durable wood. A durable softwood generally noted for decay resistance; includes western red cedar, incense cedar, eastern red cedar. Unlike many timber buildings these lodges are built with solid, two-inch thick Canadian red cedarwood walls, which have the same insulation as cavity walls. They will border Bartlett Avenue, on property already owned by Cedarwood, and will come with both covered and open parking stalls. Expert testimony in an earlier ACLU lawsuit challenging CIPA listed nearly 400 wrongly blocked sites, including the Cedarwood Sudbury School, Pennsylvania Sled Dog Club and Organic Farming. ACLU suit challenges internet blocking programs. [American Civil Liberties Union]. The top note stimulates the senses with mint, coriander and tarragon, while the heart of the fragrance dries down to a seductive musk and cedarwood. flavor and fragrance materials industry is aspartame, with other major products being, citral, mint, cedarwood, and citrus essential oils. Cabernet Sauvignon: A noble grape that produces elegant, austere wines with aromas reminiscent of black currants, olives, tea and cedarwood. Focus includes Orange, Cedarwood, Cinnamon and Patchouli to help center and concentrate thoughts and feelings. Its fragrance combines delicate notes of cyclamen flowers with cedarwood, and reflects the peaceful, immersive and meditative qualities of Tatsuo Miyajimas works. With essences of wild rose and cedarwood, the smell is calming and there are so many products to choose from. Harmonix announced the band's I Will Follow from their classic debut Boy, as well as Cedarwood Road from Songs Of Innocence will feature in the game. The new zone covers Crowood Avenue, Copsewood Walk, Elmwood, Pinewood Avenue, Linwood Avenue, Cherrywood Avenue, Beechwood Avenue, Dalewood Walk, Ashwood Drive and Cedarwood Avenue. Phil McGrath, chief executive of The Cedarwood Trust which is running the project, said: "Meadow Well's own Soup-a-Grans are all over 50 years old, long-term unemployed and each will receive training in health and safety, food hygiene, cookery skills and employability.